A garden is a place where the grownups work hard the whole day to get some food on the table. Not the most interesting place on the earth right? 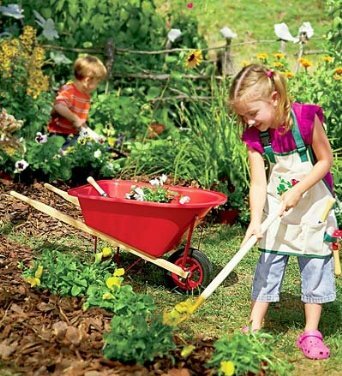 Although gardening is a serious work, you can make garden activities fun and exciting for the kids. They are curious and like to play in the dirt, after all. You should take advantage of that, and spend some quality outdoor time learning and bonding with them. Kids view gardens as a potential playground, a place for adventure and mischief. If you want them to grow up loving the nature, you need to be imaginative. There are many ways to spark the interest and get them involved. So, it is time to plant some new ideas in those small heads. Explain the importance of good nutrition for their health. Help them understand they are contributing to the family well-being. Next, you need to give them tasks that are appropriate for their age and skill. A good place to start is the basics of planting seeds. Till the soil and prepare it for them. Give them a pack of seeds and explain that they can give birth to amazing flowers or vegetables. Let them plant and water them, and see the little plants sprouting. Plants that are easy to grow are a sound choice, as you don’t want to bore kids to death. There are some crops that are suitable for children, but you can also grow something they just love. Let them watch sunflowers grow, and they will be surprised how fast these plants will catch up to them in height. Beans are another trouble-free, fast grower, and who is to say they won’t reach up to the skies? Potato is also a no brainer, as the harvest time will feel like digging for the hidden treasure. The kids will like getting their hands dirty and playing in the mud. It would be a good idea to give them a small garden spot where they can choose what to plant, and explore the marvels of gardening on their own. Let them also share the garden with their friends and they will grow to be the stewards of the earth. You can also set up planning competitions and offer prizes. Watch how the gardening becomes “cool” all of a sudden. Sometimes it is hard to separate the kids from modern gadgets, but you don’t even have to. Let them download a few gardening applications, and do some online research about plants. To further attract them to the garden, make new interesting things for it, or repurpose and remake old items. A used car tire can serve as a garden bed or plant protector. Let the children decide about the decoration, or use their crafts and arts to bring life to your oasis. You can also make the scarecrow to frighten away the birds. Just don’t make it too terrifying as you don’t want to keep the children away too. Kids love animals, so introduce a little bit of wildlife. Install a small fish pond, or a bird feeder. Still, you should warn them about pests, and explain which animals are not welcome in the garden. Worms might be gross at the first glance, but help them understand these slimy vermin are garden’s friends. Your kid might even start giving names to these maggots. Don’t forget that proper garden tools are a must for every gardener. There are a lot of colorful ones made just for kinds. They look nice, but your child would be better off with serious tools that fit the kid’s size and strength. They are sturdier and more functional that toy equipment. In a world dominated by technology, your garden should be a magical sanctuary, a peaceful and fun retreat. It is also a school of life, and every lecture counts. Guide them through the whole process, from the seed to the table. A delicious harvest will make the kids appreciate, life, nature and food. There is a season for everything, and the cycle of life continues. The Mother Nature rewards our struggles, and teaches us many virtues.